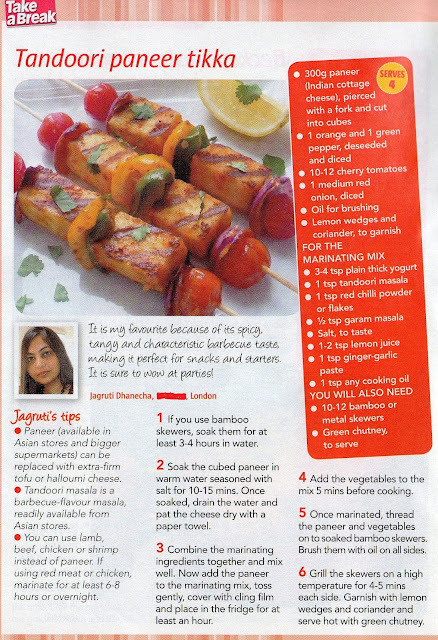 Jagruti's Cooking Odyssey: Wonderful News with Tandoori Paneer Tikka ! I really appreciated your time and effort for when you voted for my recipe Spinach Daal last month. Even though I did not win the full competition, I am overwhelmed to tell you that one more of my recipes has been published in this months Take a Break -My favourite recipe magazine. The paneer tikka looks awesome and beautifully served..I always like your presentation Jagruti.. I will definitely vote for it as I did last time too. Wonderful presentation Jags. Hope you win. jagruti the paneer tikka looks so very yummy. I really appreciate that you have donated the prize money to the needy. I hope you win many more.